Create an Adventure Pack for even more fun with your kids! A small backpack our daughter can wear filled with tools for exploring. Earlier this summer, I wanted to purchase what I would call a kids adventure pack for our daughter. I was hoping to find a pack for her age that would help her notice and explore the world around her a little more. I was able to find several versions for older kids (which will be fun to get someday) but none that I thought a child who could not read yet would be interested in using. So, we created our own! Note: she LOVES wearing her own little Adventure Pack. She insists on wearing it when we're hiking or riding a bike. That is pretty cool to me (and I'm hoping that it will get her ready for a new type of adventure: backpacking). The contents of our daughter's Adventure Pack. Our daughter wearing her Adventure Pack while exploring a trail in Colorado. Notebook - to record thoughts about where we've been, to make leaf rubbings, or draw pictures of the flower we just saw. Crayons - pencils are good for drawing and writing, but crayons work best for making leaf or bark rubbings. Compass - it's never too early to start little ones in learning their directions and using an old fashioned compass is a pretty fun way to introduce this skill. Whistle - this is a safety thing. We taught our daughter that if she couldn't find us, to just sit down, blow her whistle a lot and wait. Magnifying Glass - for looking at things up close. This is one of her favorites from the bag since it's so cool to look at flower stems or bugs that are really big. Critter Jar - you just never know when you might want to capture that beetle so you can research it when you get back to your base point. Small peanut butter jars or spice jars are little enough for the pack and are clear. Thermometer - Kids like to measure things and measuring the temperature of the air or the puddle of water is pretty neat. Record your findings in the notebook. Binoculars - for those times you wish you could see that pretty bird better that's at the top of the tree. Snacks and water bottle - helps the little ones stay hydrated and full of energy. Sunscreen - this is one item we always forget and since our daughter is so fair skinned, she burns too easy to leave it behind. Kleenex - not just for noses, tissues are quite handy for wiping all sorts of body parts in the great outdoors! Eventually I want to add a camera to her pack. I would add one now, but the cute little kid cameras really take terrible pictures. If I purchased one today, it would be a quick point and shoot that was waterproof and had digital zoom only (so that one did not need to worry about a retractable zoom lens). Fuji makes a great waterproof camera that would be perfect for this. Gotta save the pennies! 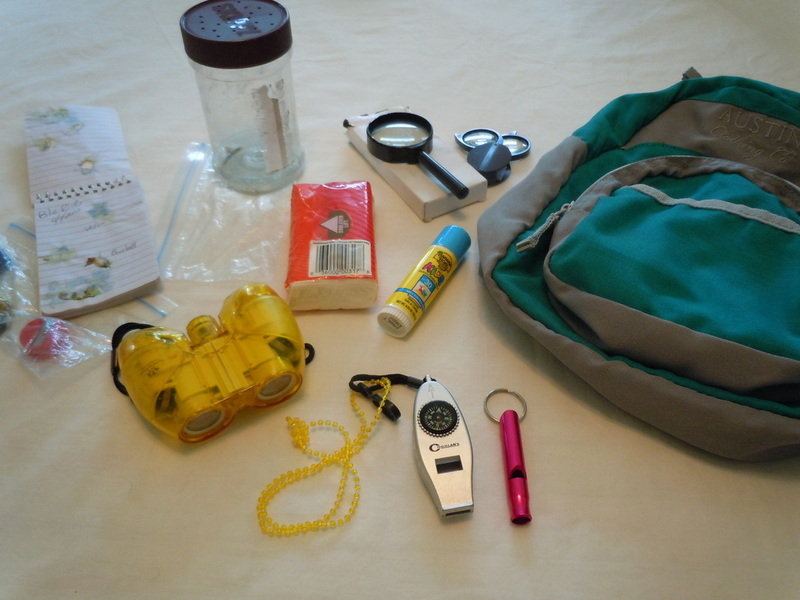 I attended a conference recently and one of the workshops I listened to validated the use of an adventure pack. It was titled the "Quiet Schooling of Nature" and the speaker encouraged the audience to buy a notebook, grab some colored pencils and go exploring with the kids. She said the next level up would be to get your kids a magnifying glass for some serious observation. Wow...I had already done that! Talk about validation! 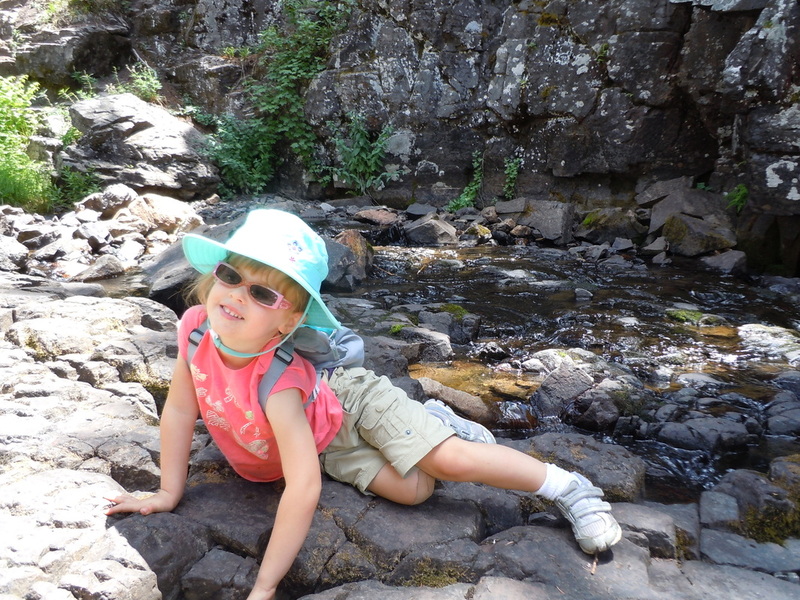 Have you created an Adventure Pack for your kids? What would you put in it? Leave a comment on our blog!